I was waiting for an appointment where a copy Michel Angelo’s “Hand of God” was hanging on the wall. 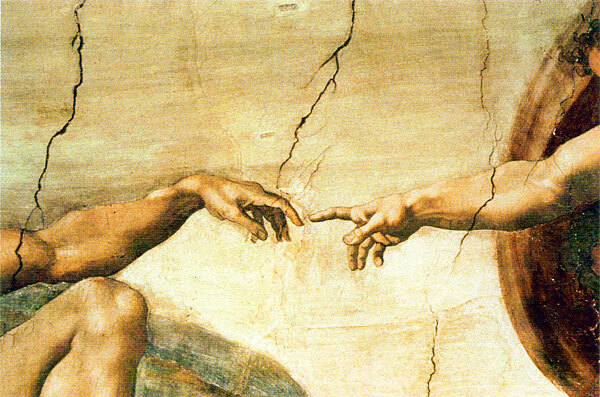 As I studied the details, I noticed a difference in the hand of man and the hand of God. The hand of man is on the left and his arm appears to be supported by his knee. Man’s hand is also shown as lacking strength as it is reaching to meet God’s hand. The fingers of man are hanging down as if it is taking great effort. God’s hand is on the right and shows strength. His arm, wrist and fingers are fully extended showing effort to reach out to man. The radiant appearance of God’s skin does not show the signs of toil. I concluded that Michel Angelo knew that our strength comes from God. He captured this in the details of each hand to tell a story.